SKF NOTE: What a band! I read recently these four compatriots never performed together live. What a shame. Four great players. A showcase for Alan Dawson. This was the first time I heard the side of Alan Dawson that influenced his student, Tony Williams. 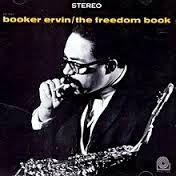 Booker Ervin‘s version of A Lunar Tune (Ervin) from his album The Freedom Book. Recorded at Van Gelder Studio, Englewood Cliffs, NJ, on 3 December 1963. Produced by Don Schlitten for Prestige Records. Personnel: Booker Ervin (tenor saxophone), Jaki Byard (piano), Richard Davis (bass), and Alan Dawson (drums). This entry was posted in SKF Blog and tagged Alan Dawson, Booker Ervin, Drummer, Jaki Byard, Richard Davis, Scott K Fish. Bookmark the permalink.